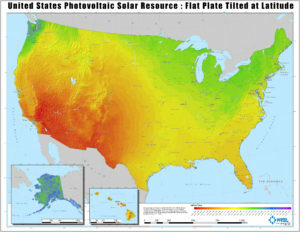 This map shows the solar resource in the United States for photovoltaic systems. This map shows the wind resource for residential size wind turbines at 30 meters (about 100ft). 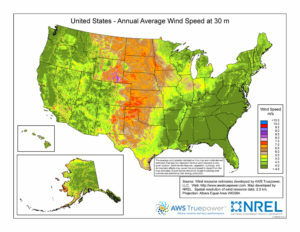 The Department of Energy’s Wind Program and the National Renewable Energy Laboratory (NREL) collects and publishes wind energy stats and data. Many Alabamians thing the wind blows enough where they live to generate a lot of power. Believe this map! Look at the video above showing wind energy harvest from the shore of a large Alabama lake. Even if these turbines were mounted at 100ft (imagine the cost), it would make little difference. Alabama has very few places where harvesting wind energy is feasible. Yes, we have installed a few for people that want one. Wanting a wind turbine is about the best reason for having one. I think most Alabamians that have one have lost their appetite for them. Advancements in turbine technology have lowered the wind speed necessary to produce power to around 4.5 meters per second. Even at that number, Alabama does not make the mark. So, wind will likely not provide a lot of your power. But it might just be a part of your overall package to reduce your dependence on fossil fuels.